This is is personalized chair that Ben and I got him. He loves it! It's even big enough for me to sit in, haha. I'm hoping this means he'll be able to use it for a loooooong time! His great-grandparents (Ben's Grandmother and Poppy) gave him wooden letters that spell his name. Poppy is in the process of finishing up a homemade toybox for Aidyn made out of wood. He put the names in a giftbag since the toybox isn't quite finished. Ben and Aidyn went by their house a few days later to show Poppy how we want the letters and to take the wood stain that Ben picked out. I can't wait to see it! Uncle Thomas and Lesley bought Aidyn a ball pit...I guess that's what you'd call it. He gets a kick out of laying in the bottom with all the ball rolling around and playing. What a great idea! Aidyn's great-nana (my grandmother) and Papaw Gary gave him a book titled, "Jesus Loves Me". It's so cute because it has a hole cut where the character's face should be. Instead, Aidyn's picture is taped in the back of the book and so it's as though he's the main character. How cute! Gary also made him some homemade wooden blocks. Fun! Faith Ann (Aidyn's 3rd cousin, I think) had a great time helping him open all his presents! She was such a big help. Aidyn's Nonnie and Bubba (Ben's parents) got him a 4-wheeler. It's battery operated and just has one button which makes it go on the handle bars. He's gotten pretty good and climbing on and making it go. 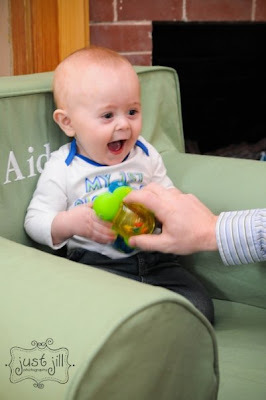 Our friends Daniel and Rachel bought Aidyn a small drum that came with other little instruments inside. We ended up having to take the drum sticks away because Aidyn kept using them as oversized chew toys...probably not a safe idea. Aidyn's Mom-mom and Papaw (my parents) bought him a tricycle. It's neat because you can pull the yellow handle up in the back and push him around. He isn't quite tall enough to reach the pedals yet. Or...you can fold the yellow handle up under the bike and it becomes like a rocking horse, except it's a bike. Or...you can take the yellow hand compeltely off (when he's big enough) and he can ride around and pedal on his own. How neat! "Wow! Look at all my toys!!!" What a great day! Thanks to everyone that came for Aidyn's 1st Birthday Party...he had a wonderful day and got lots of neat things! 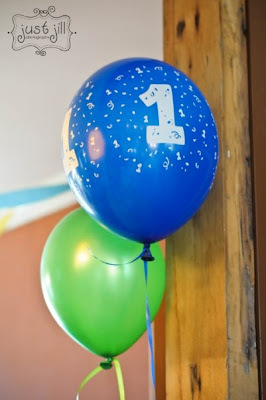 Since we have TONS of pictures thanks to my wonderful camera, my mom, and our photographer (Jill), I decided to do a few different posts of Aidyn's birthday each with a different "theme". So...here are a few non-party pictures before everything began. Since Aidyn doesn't really eat sweets, I did a white cake and white icing. Still sugar I know, but just wasn't chocolate. We used food coloring to make all the icing, for his cupcake and the others, match his party decor. Cupcake "tower" my mom bought. She came over the nights before and was going to "help" me icing all the cupcakes...I made 48. She ended up doing them all by herself while I played and entertained Aidyn. Thanks, Mom! Ben's mom brought a large punch bowl (with green punch) that we sat on the end beside the cupcakes. Thanks, Leeann! Ofcourse we all know that playing with large empty boxes is always more fun than actually playing with the toys that came inside. He loved being able to "flip" the top peices back and forth and bending down to hide from my mom. But, once he realized he couldn't get in and out on his own, he wasn't such a big fan. Once we got him out, we set the box on it's side up against the front door so he could play with it there. Don't you wish they boxes big enough for adults to play in??? ...I never imagined the changes, experiences, and love that was about to turn our lives upside down! A year ago today (on Monday, January 26th @ 7:30pm) Aidyn Garland Evely entered our lives. We were so excited, nervous, relieved, scared, and happy all at the same time. As this past year has FLOWN by, to say the least, we have had many fun times and some worrisome times. There have been so many times that I've thought, "If we could just make it to "that" point or this particular event..." such as sitting up, eating solids, crawling, walking, etc. I now find myself thinking those thoughts and then correcting myself and saying, "No....don't wish the time away. It all happens so fast." And believe me, boy is it fast! My little, teeny tiny baby (7lbs 1oz and 21in long) that was unable to nurse and jaundiced because he wasn't getting enough to eat in his first few days...is not so teeny tiny anymore. My little, teeny tiny baby is growing up right before our eyes. *He ate a cupcake all by himself on Saturday when he we had birthday party (a few days early). *He ate pizza for dinner the other night and Chic-fil-a chicken nuggets tonight. *He LOVES books and enjoys sitting and "reading" them all by himself. *He can walk, turn, and run the other direction all in one motion and never miss a beat. *He knows who Mommy and Daddy are. He knows what a ball and a bite are. He knows what his milk is. Each day is a new adventure watching him grow, explore, and learn new skills and "tricks". and the way he amazes me each and every day with his knowledge, curiosity, skills, and more. 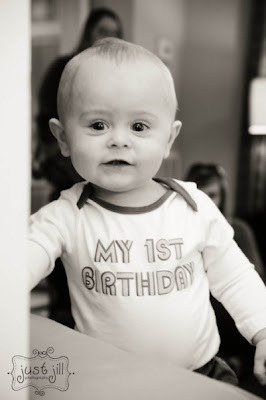 *I began this post on Tuesday, Aidyn's birthday, and just now got around to finishing and posting it. Well, I FINALLY did it. I finally upated the blog with all the pictures that I've taken since Christmas. Unfortunately, it won't last long. ;) Aidyn's birthday is next Tuesday (a week from today) and so we're having an early birthday party with our families on Saturday. So, looks like I'll have lots of pictures to load aftewards. Well...a few weeks aftewards. We debated on what kind of party to have and we settled on a family party this year. I figured since Aidyn's only a year old, and won't really know what's going on anyways...except that there are going to be LOTS of people in his house...he isn't going to care. However, that doesn't mean we aren't celebrating. I was so excited to order his invitations with his picture, mail them out to all our family, shop for his "perfect" gift, book the photographer to come so that we don't have to worry about any of us taking pictures and missing the fun, shopping for his cupcake pan, and more. We are going "simple" this year and hope to do something bigger in the future with friends and more people, when he knows the reason everyone is together and visiting. Every time Aidyn's in the bathtub, he wants to play with the shower "pull"...I don't know what else to call it. The little piece on the spout that you pull up to turn the shower on. Now, the water is never running when he likes to pull it up and down, up and down, and so on. But, since he enjoys doing that, he's also managed to bump his head on the spout several times when he's gone to stand up next to it (or under it). So, when I was at BabysRus yesterday, I decided to buy a spout cover. He also enjoys yelling when he's in the bathtub, and making LOTS of splashes! I stood there probably ten minutes the in the bath aisle trying to decide which one to get. I decided on the cheap, $3.29 inflatable cover that you blow up yourself. I figured better to start with the cheapest and then if it didn't work, I'd try the next one. No need spending $18 on one if the $3 model worked just as fine. And it did! Now, not only can Aidyn not pull and jerk the little knob up and down, he also isn't able to bump is head on the spout end. Yay! Our only problem now...the plug (that you use to blow up the cover, like on a beach ball) won't push down into the cover. So...now he keeps trying to stand on his tip-toes so he can reach the plug and put it in his mouth. Ahhh! I guess the saying goes, "If it isn't one thing, it's something else." *BTW...can you tell that I totally love my new camera that Ben bought me for Christmas? Sorry for the huge amount of pictures...but I just can't resist. I LOVE it! Thanks, Ben!!!! After being 16' for the high last week on several days (maybe colder), it was 56' yesterday...on MLK, Jr Day. After such an increase in temperature, and the presence of the sun, I couldn't resist taking Aidyn outside and letting him play. He still isn't too sure of the "bumpy" ground and cool, damp grass. He toppled over several times when trying to walk around the yard. When he would catch himself or try standing back up, he didn't like the grass on his hands...or so he seemed. He lasted only about 15 minutes and then he was done. The bright (beautiful) sun was shining in his eyes (he has sunglasses but doesn't like them) and he was more than ready for a nap. So, we went in ate a bottle and took a much needed nap. Hopefully the temps will stay up and we can play some more and maybe bundle up in the stroller and go for a nice walk. I will admit that I'm not quite ready for spring...ONLY because we have a ski day planned with our youth in 2 weeks on February 6th. It has to atleast "feel" winter on that day or the snow will be slush and the conditions will be terrible. However, after February 6th...come on, spring! A while back, Aidyn "learned" how to climb up our stairs. If you read our blog pretty regulary, you probably saw pictures. Well, now he pretty much tries to climb up on top of ANYTHING that he can get his knee up on. Such as file boxes, beanbags, ottomans, into clothes baskets, etc. He also enjoys playing in the toilets and splashing around...so we now keep all bathroom doors shut! Fun, fun. "Do I throw it in this basket with the other toys?"